I love camera bags. It seems that I have a new bag every 6 months. The reason why is that it’s so hard to find that perfect bag. Some excel at certain things while others excel at others. So when I heard about PeakDesign’s new Kickstarter campaign dubbed the Everyday Backpack, I was very intrigued. Knowing the guys at PeakDesign and how good the Everyday Messenger was, I keenly followed, backed, and possibly stalked. For months I watched all of their Google Hangout videos, watched all the promotional material, and checked the discussion board on Kickstarter. I feel like I knew the product pretty well and that’s why I was able to open and review the bag quite thoroughly the first go around. It’s not just professional photographers that need good backpacks but the everyday traveller as well. 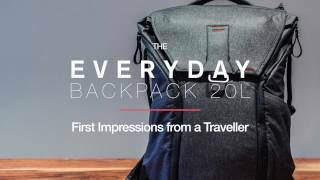 As a traveller, I need an exceptional day pack as a companion to my main pack/suitcase. It needs to be able to handle a ton of different scenarios. It needs to be able to withstand the abuses of travel. It needs to keep my many things safe whether big or small. What they wanted to build was a bag that had all the pockets, slots, and space for the photographer but with the versatility to carry things other than just the camera gear. That’s why the Everyday Backpack spoke to me in every possible way. Lots of compartments to store small things like pen, passport, memory cards, gum, etc. The Everyday Backpack checks all those boxes. So you can imagine how excited I was to finally receive one of the bags I was hoping to receive. See how the unboxing went down. Fair warning that it’s a bit long but I run through everything I know about the bag and get to jam it with things I’d typically pack on a trip. The 20L variant of the Everyday Backpack is the smaller of the two sizes available and as such I expected it to be a nice compact size that might be too small for those bigger trips where you want to carry more. Attention to detail – It’s insane the amount of detail they put into every single one of their products. I was blown away when I saw that they included red stitching on the inner velcro lining to help you make sure your dividers are lined up properly on each side. Pockets for everything – There are so many pockets and slots for every imaginable travel item. You have shallow pockets for cables and headphones while you have deeper pockets for notebooks and laptops. And then you have the side pockets which are perfect for pens, batteries, memory cards and things like gum and mints. Handles – Handles are sturdy and love the added ability to slot the bag sideways through a suitcase handle. Straps – The straps are pretty comfortable though I have noticed because of the pivot points on the straps that they do tend to spread apart which is why I might be inclined to use the sternum strap more than usual. Waterproof – I’ve dripped water all over the bag and it beads effortlessly. Looks – The charcoal grey that I have in the 20L is just so damn sleek. Love that it’s not a bag that draws unwanted attention but at the same time is something that you’d want to wear everyday because of how good it looks. MagLatch – Just as easy to use as the Everyday Messenger and gives you top access to a large compartment good enough for a light jacket. Careful packing – You have to be careful how you pack your camera gear since side access opens on both sides. You don’t want to accidentally open one side and have stuff slipping out. Tight side pockets – This may be different on the 30L but I’ve found the side pockets to be pretty slight. You’ll see that my Hydro Flask just fits in there. I’ve been able to put in my carbon fiber tripod as well but anything bigger than what I have would be a struggle. In short, would I use it as a day pack? Yes. Should travellers consider this backpack? Yes freaking yes! Side pocket with just enough space to fit this Hydro Flask. A look at the inner pockets of the wings that provide additional storage for things like batteries, pens, cards, etc. This bag is packed full of features that would make anyone “ooh” and “ahh” over it as I did. The materials are top notch and the design is near flawless. For any sort of traveller that carries camera gear or even if you don’t, you’ll be able to leverage the smart compartment system to bring with you everything you need for the day. Size wise, I will say that it does leave the desire to get something a little larger especially if you travel with a full frame DSLR or you’re going on a larger multi-day trip. That’s where the 30L Everyday Backpack comes in. This backpack is starting to drop in stores like B&H Photo Video at the price of $259.95 USDGet your Everyday Backpack 20L today! First off, thanks for your posts on Iceland and Peru. I’m heading to Iceland in May 2017 for 16 days and Peru next year and your posts have been a tremendous help in figuring out the itinerary and figuring out what to bring. My boyfriend has the same bag and he’s been raving about it, but I’d like someone else’s opinion. I’m thinking about getting this bag for my trips. Since you’ve been to both places, do you think this would serve as a good day bag for hikes (e.g. Inca Trail)? I’m not a photographer at all and don’t have all the fancy gears. The bag just looks so awesome and it seems a lot of thought was put into it. Many thanks! You’re very welcome! If you’re going on a larger trip like Iceland and Peru, I’d definitely recommend the 30L over the 20L. With the 20L, you’ll be a bit more restricted on space which might be an issue. More recently, I used the 30L (which I also have) and it was great for all of my rolled up clothes in each compartment. With the 30L, you can put in a lot more stuff in there at the end of the day. The question is, how much do you want to bring with you on any given day. Now if we look at the 20L, it might be possible if you’re able to pack very lightly and especially without the camera gear it might be possible. Iceland wise, you’ll be good here since you’ll most likely have a car and any excess stuff you can keep in the back seat or in the trunk. For the Inca Trail, that’s where I’m thinking the extra space may come in handy but if you feel that you can keep things to a minimum since the porters are carrying most of your stuff, you could totally go for the 20L as well. I think if there’s one thing that these don’t have that you might want for the Inca Trail is a hydration pack. That being said, you could just as easily use a water bottle but it might not be as convenient.